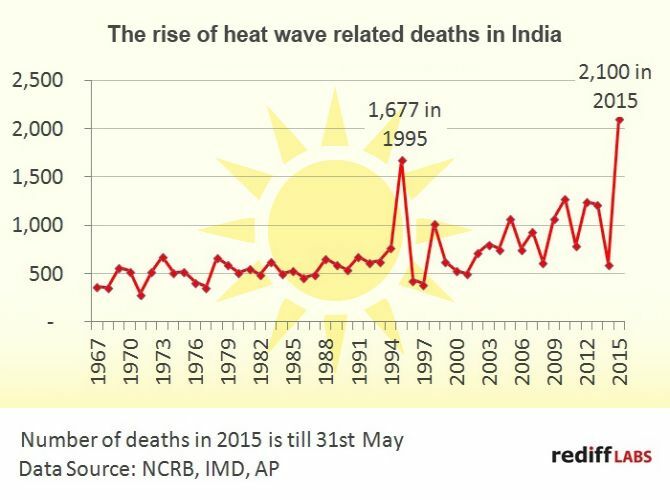 The graphic above shows the number of heat wave deaths in India each year since 1967. The 2015 heat wave has been the deadliest since 1967 causing a record number of deaths (2,249 deaths till 31st May 2015). India went through another killer heatwave in 1995. 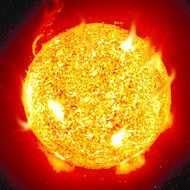 According to the Indian Institute of Science, the 1995 heat wave persisted for an exceptionally long period of around 29 days. As per NCRB records, it claimed 1,677 Indian lives. According to scientists, one of the main reasons for the 2015 heat wave is the El Nino which occurs in the Pacific coast of South America and affects the Indian monsoon. Data for 1967 to 2013 is taken from National Crime Records Bureau. Data for 2014 is taken from Annual Climate Summary - 2014 published by Indian Meteorological Department. The heat's just killing this summer!